Good Heart interweaves the stories of a Jewish family and a Christian family over three generations. Bobby Langford and Danny Baranson lead classic American childhoods together in small-town Indiana in the 1960s and ’70s. But any notion that these boys’ lives are run-of-the-mill is dispelled when we flash back to the family histories that led them there. As we follow Bobby and Danny’s lives through adulthood, characters from vastly different backgrounds are pulled together by twists of destiny, drawing them all to one special place: the land of Israel. 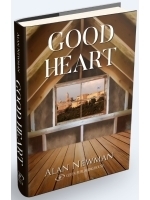 Good Heart is embedded with gems of Israel’s history and culture, giving nuanced insights through tangible human stories. From an Israeli army base to an Indiana evangelical church, from World War II Austria to the Sudanese desert, exotic locales pepper this adventure with the ultimate discovery that even those who seem worlds apart are all interconnected.